If you’re importing CAD data into SketchUp, you may have to perform some cleanup. Most of the time, your imported CAD file looks something like the mess shown below. Walls, annotations, grid lines, and other stuff are all jumbled up, and it seems like you’re going to have to spend the rest of the week deleting edges. Probably not, actually. 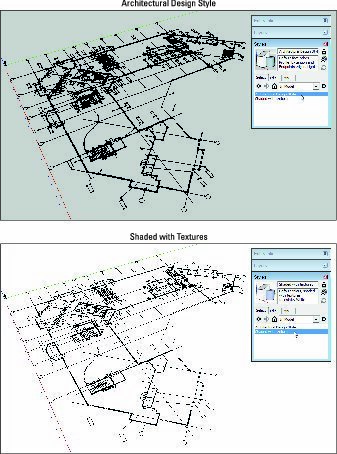 If you’re using a display style that includes lots of edge embellishments (such as Profiles, Extensions, and Endpoints), dense geometry of the sort in most CAD drawings looks like your model received an unwelcome visit from the Mascara Fairy. Yuck. Use the Styles panel to apply a style that’s plain and simple. Try either Shaded or Shaded with Textures, both of which you can find in the Default Styles collection. Applying a simple display style to a model with imported CAD data makes it a lot easier to work with. Most of the drawing symbols and other annotations you brought into SketchUp aren’t things you need, at least right away. The simplest and safest way to get rid of them is to turn off their layers. Remember that SketchUp Pro also imports all of the layer information associated with the CAD data you brought in; now’s the time to use all of that complexity to your advantage. CAD files usually come with dozens of layers. Make the Layers panel nice and big so you can see more of them. Open the Entity Info panel. The Entity Info panel tells you which layer a selected entity is on. Context-click any part of the imported CAD drawing and choose Edit Component. As long as your model contains at least one entity when you do a CAD data import, SketchUp Pro automatically puts all the imported geometry into a single component. Whatever you do, try not to explode this component. Select an entity that you don’t want to see right now. A grid line is selected. Look at Entity Info to see what layer contains your selected entity. In this case, the selected grid line is on layer A-GRID. Find the offending layer in the Layers panel and turn it off. Switching off the A-GRID layer temporarily hides all the entities on that layer. Better already! If you’re positive you won’t need the contents of a particular layer, you can delete it altogether. Repeat Steps 4–6 for all of the entity types you want to hide. This part of the cleanup process is pure SketchUp catharsis. It takes time, but the results are immediately visible. Select things you don’t need and hide the layers they’re on.